Announcement Welcome! Come on in, look around, check out all the details on the wide variety of items I have here. Everything I designed and made myself, by hand, with lots of creative magic. My intuitive soul is my muse. For more inspiration and stories, links to my on-line classroom, Instagram and more, go to www.artisticimprint.com . My website is packed with lots of stories, artwork, and don’t forget to check out my free classes Zenflower Mandala Level 1 and Infinite Blooms in the classroom link. Have questions about my products, services, or classroom, just contact me at any of my sites online and I will get back to you with an answer. Welcome! Come on in, look around, check out all the details on the wide variety of items I have here. Everything I designed and made myself, by hand, with lots of creative magic. My intuitive soul is my muse. 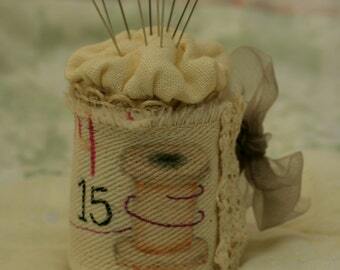 Beautiful, lovely, unique, well-made, handmade spool pin cushion! I love it! Pleasant conversation with Karen. I highly recommend this shop!!! I love to work in art journals. My handmade art journals are where I learn and experiment with techniques. To occasionally provide you with coupon codes for exclusive sales.